Crazy Mountain Cattle Company invites you to come share the life of a Montana ranch family! Our ranch includes 2500 acres west of Big Timber, Montana and 2000 acres leased just south of Big Timber on the scenic Boulder River. Come join us as we go about whatever seasonal ranch chores need to be done. With 300 head of Angus cows, 250 head of sheep, sheep dogs, horses, and various other animals there is plenty to be done! What exactly is a ranch vacation? At Crazy Mountain Cattle Co. we offer a unique experience that lets you decide how much or how little you would like to do. There is no set itinerary so you can choose your level of activity and participate in activities that are of particular interest to you and your family. We host only one family or set of guests at one time in order to provide a real hands-on experience. This is no "dude ranch" where you are only one of dozens of people getting a "manufactured" western experience. Depending on the season, you can participate in lambing or calving, fencing, irrigating, moving cattle or sheep from pasture to pasture. 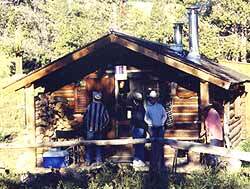 Come stay in the remodeled bunkhouse or in the guest rooms of the main ranch house and eat three hearty meals a day with our family. We guarantee you will work up an appetite. We are centrally located in Montana just two hours from Yellowstone Park, the scenic Beartooth Pass, and right on the Lewis and Clark Trail. When you come stay with us you may choose to limit your ranch activities and schedule you own day excursions to places of interest while using Crazy Mountain Cattle Co. as your home base. 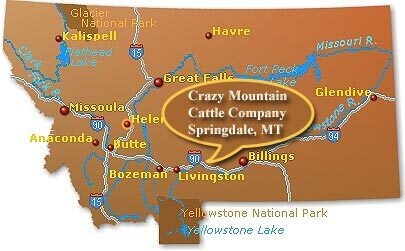 Who is Crazy Mountain Cattle Company? Rick Jarrett is a fifth-generation Montana rancher whose ancestors homesteaded in Sweet Grass County, Montana in the late 1880's. Over one hundred years later the Jarrett family is still involved in production agriculture in Sweet Grass County. The ranch is a family affair as Rick's daughter, Jami, and her children Jordan (10) and Jess (8) live and work on the Boulder place south of Big Timber. We were honored to be featured in the May 13, 2008 edition of Fortune Small Business Magazine. Click here to read the article online. Thank you for visiting our website and we look forward to having you as our guest! Site designed & hosted by Big Sky Internet Design, Inc.